Silver has been considered money throughout most of recorded history. Physical silver is a tangible asset with no counter-party risk or default risk. Silver has an intrinsic value due to its metallic characteristics making it suitable for industrial, medical and ornamental use and due to its finite supply. There are many reasons to buy silver, chief among them the fact that silver is money, a form of saving and a form of investment all at the same time. There are also compelling fundamental reasons to buy silver. Demand from the silver investment bar and coin sector is strong with demand also being supported by the diverse industrial and technological applications which require silver. With demand outstripping supply, and with silver mining output set to shrink in the future, the silver market looks fundamentally strong. Furthermore, above-ground stockpiles of silver, unlike gold, are very small, which puts another constraint on potential supply. Potential manipulation of silver prices is an additional consideration which may put upward pressure on the price during the future. Silver has been used as money for thousands of years, with many of today's names for money are derived from the use of silver as money. The word ‘Dollar’ comes from Thaler, an abbreviated form of the German word ‘Joachimsthaler’ which was a coin from the German Joachimsthal silver mine. The British ‘Pound’ is named after a ‘pound’ weight, which was equal to 240 silver ‘sterling’ pennies made from 1 pound (weight) of silver, hence the term ‘Pound Sterling’ today. In addition, the Indian Rupee, the French word for money 'Argent' and the famous Peso of the Spanish Empire originate from terms describing silver in one way or another. The US Constitution, Article 10, section 1, specifies that “No State shall … make any Thing but gold and silver Coin a Tender in Payment of Debts”. The US Coinage Act of 1792 also specifically references silver, defining a dollar as 371.25 grains of silver with the proportional value of gold and silver at 15 to 1. Up until 1964, the circulation US quarter dollar coin was issued as with 90% silver content and a total weight of 6.25 grams. As a perennial form of money, silver has long been adopted and accepted as a workable money in a free market precisely because silver embodies the universal characteristics of money. Silver coins are durable, relatively scarce, universally accepted, fungible, portable and cannot be debased, and are therefore suitable as a medium of exchange and unit of account. Physical silver has intrinsic value and lacks counter-party risk and default risk. Silver also retains its purchasing power over long-periods of time, as does gold, and is thus suitable as a store of value and as a long-term hedge against inflation. Silver has many different properties which make it useful in a multitude of different roles. Of all the metals, silver is the best conductor of heat. Silver is also the best conductor of electricity. In addition to its usage as money, the conduction properties of silver allow it to be widely used in electrics, batteries, and electronics. Silver is also the most reflective metal when exposed to natural light, hence its use in jewellery, silverware and more recently, solar panels. Silver nitrate was critical for the evolution of photography, and silver is still used widely in the photography industry despite the rise of digital photography. Silver's anti-microbial properties have found it applied recently as nano-particles in sweat resistant clothing and as a germ fighter. Silver has long been used as a water purifier, and is now also found in medical equipment and hospital instruments. Silver's many useful properties and usage in a wide variety of applications and consumer goods means that the demand for silver is driven by a diverse number of sectors which compete for available silver supply. According to the 2018 edition of the World Silver Survey published Thomson Reuters/GFMS and The Silver Institute, demand for silver in 2017 totalled 31,650 tonnes. Of this total, industrial fabrication accounted for 59% of demand, equivalent to 18,630 tonnes. Investment silver coins and silver bars accounted for 15% (4,700 tonnes), jewellery demand represented 20% equivalent to 6,500 tonnes, and silverware (such as cutlery, tableware and ornamental silver) represented 6% or 1,800 tonnes of total demand. Within the large industrial fabrication demand, electronic and electrical applications comprised the biggest component, generating 7,560 tonnes of silver demand, while applications in the fields of silver alloys, photographics, and solar cells generated another 6,080 tonnes of demand, with the remaining 5,000 tonnes arising from other diverse industrial end uses not captured by the above categories. These diverse demand drivers for silver underscore silver's unique position as both a monetary asset with inherent intrinsic value and as a commodity asset with sophisticated and important value and uses to society. Due to the large industrial demand for silver, the silver price is more exposed to economic cycles than the gold price, precisely because of silver’s multiple industrial uses and its relatively small above-ground stockpiles compared to annual silver mine supply. The silver price is therefore often more volatile than the gold price. Global demand for silver bars and silver coins exploded with the onset of the financial crisis in 2008, a trend driven by savers and investors moving into tangible assets such as precious metals, which are seen as safe havens and stores of value. According to the World Silver Survey, produced by Thomson Reuters GFMS, demand for silver bars and silver coins totalled 1,740 tonnes in 2007. By 2017, the comparable figure was 4,700 tonnes comprising 2,229 tonnes in physical silver bars and 2,471 tonnes in silver coins and medals. Silver supply is predominantly derived from mining and to a lesser extent from scrap recycling. Within the mining category, about 30% of silver supply mining supply comes from primary silver mining, the rest is generated as a by-product of gold, copper, lead and zinc mining. In 2017, silver supply totalled 30,840 tonnes, with mining operations producing 86%, equivalent to 26,500 tonnes, of this total, and scrap recycling accounting for the remainder. Since silver demand totalled 31,650 tonnes, there was a supply deficit in the silver market equal to about 800 tonnes or about 2.5% of total silver demand in 2017. The global silver market has been in a deficit position since 2013. CPM Group, a precious metals consultancy, estimates that silver mine supply will fall further, adding additional pressure to silver supply. Whereas most of the 190,000 tonnes gold ever mined is still in existence in various forms of above-ground stocks such as jewellery, private gold holdings or central bank reserves, much of the silver mined throughout history has been lost or consumed and/or isn't economical to recycle. Of the estimated 1.5 million tonnes of silver ever mined, over 600,000 tonnes has been lost or is unaccounted for. Thomson Reuters GFMS has identified the relatively small above-ground stockpiles of silver available, and estimated that these stockpiles totalled about 86,600 tonnes at the end of 2017. This would represent less than 3 years of silver demand. However, more than 60% of these stockpiles are private stocks held in custodian vaults which are held by investors who may be reluctant to sell. Dormant scrap silver supply can also be induced into the silver market, but this generally happens only when the price of silver rises to a higher level. The largest trading markets for silver are the wholesale silver market in London, where silver is traded over-the-counter on spot basis, and the COMEX New York silver market there silver futures are traded on an exchange platform. These two markets dominate price discovery for silver. However, both of these markets are based on vast paper trading with little physical silver supporting the gigantic trading volumes. The amount of silver cleared each day in the fractionally-backed synthetic paper silver markets in London is staggering. On average, more than 6,500 tonnes of silver was cleared each trading day in the London Silver Market during 2018. With trading volumes about 7 times higher than clearing volumes, this would mean the equivalent of 45,500 tonnes of silver is traded each trading day in London, which is more than global annual mining supply of 33,000 tonnes. This is equivalent to 11.4 million tonnes of silver traded each year in London, which is about 360 times annual mine supply, and more than 7.6 times the total amount of silver ever mined (which is estimated to be 1.5 million tonnes). It can thus be concluded that the silver market in London is predominantly a fractionally reserved system with little backing in form of physical silver. The LBMA Silver Price benchmark is used globally as a price and valuation source by much of the global silver market. The London Bullion Market Association (LBMA) however severely restricts those who can participate in the auctions used to arrive at the benchmark price. In a market which is estimated to comprise 500-1000 active trading entities, only 6 large LBMA bullion banks and a number of LBMA member trading houses are allowed to participate in the auctions. The LBMA Silver auctions also see very low volumes which are not close to representative of the size of the physical silver market. The 5000 oz silver futures contract traded on the COMEX in New York, is the world’s most liquid silver futures contract. 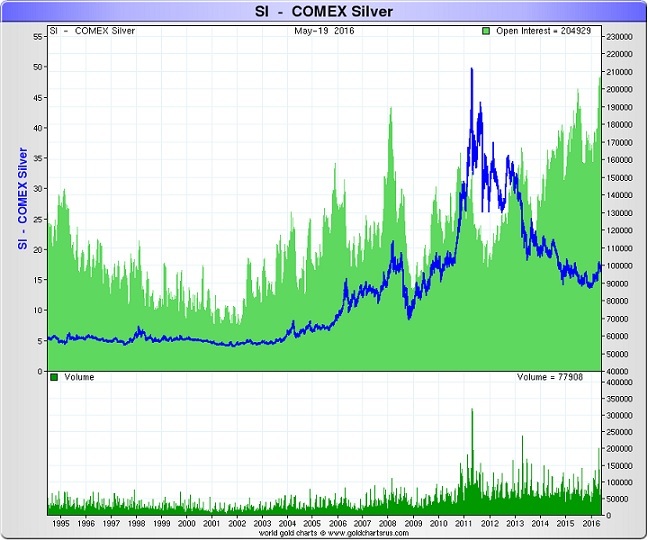 The COMEX silver futures trading is criticized for enormous Open Interest figures. Coupled with very small warehouse inventories and even smaller physical deliveries, this suggests that silver futures trading on COMEX is predominantly a speculative activity of paper trading. 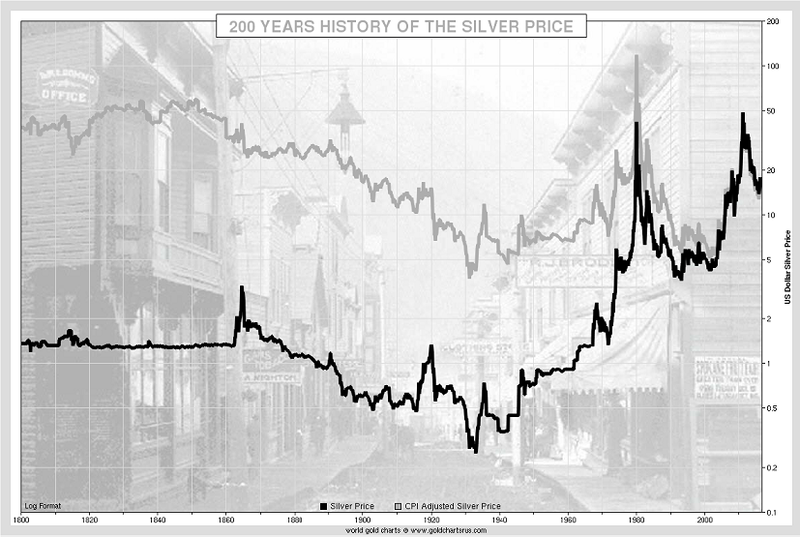 There is thus a large disconnect between silver futures trading, which influences the price of silver, and trading of real physical silver. The Open Interest on the COMEX silver futures contract is defined as the amount of silver futures contracts outstanding at any given time. Open Interest has been on an upward trend over the last number of years, and as of late 2018 was above 200,000 contracts. An Open Interest of 200,000 contracts represents 31,000 tonnes of silver, which is approximately equal to the yearly silver supply. However, there are only 6,400 tonnes of silver available in the COMEX warehouses (eligible stocks) and about 2,500 tonnes of registered silver for which a document of title has been issued. Gold and silver have been closely related throughout history. Both are precious metals and naturally occurring elements. Both elements have multiple useful properties and both gold and silver have evolved as pre-eminent forms of money. It is therefore not surprising that the value of silver has always been compared to the value of gold, and vice-a-versa. This gold to silver comparison is known as the gold/silver ratio. The gold/silver ratio measures how many units of silver it would take to buy 1 unit of gold. Although the gold/silver ratio remained near 15-16 in the pre-1900 era, it has roughly been fluctuating between 20 and 100 in the last 50 years. 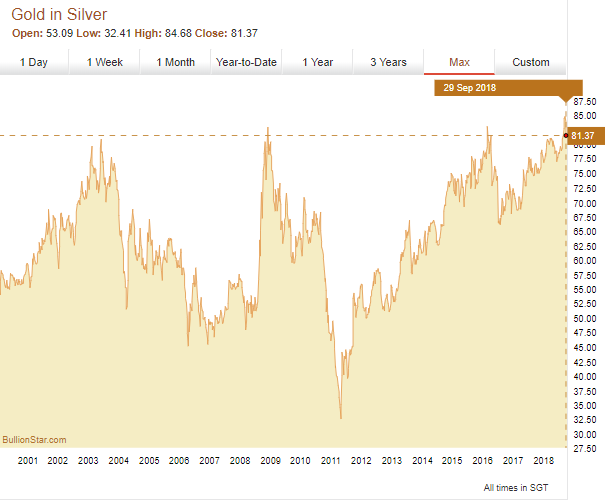 What is an appropriate long-term gold/silver ratio? Data reflecting gold and silver's relative presence would suggest that silver is 8 times more abundant than gold in the earth's crust. If we instead take contemporary mine production, the ratio of silver to gold mining suggests a ratio of 8.6. The world's remaining in-ground silver reserves divided by the world's remaining in-ground gold reserves would instead suggest a 10:1 ratio. During the period of the Roman Empire, the gold/silver ratio was fixed at 12:1. Issac Newton, Master of the Royal Mint, formulated a view in 1717 on "the price and relationship of gold to silver" wherein he discussed ratios such as 15/1 and 15.5/1 between gold and silver. Similarly, the US Coinage Act of 1792 deemed that "the proportional value of gold and silver in all coins, which shall by law be current as money within the United States, shall be fifteen to one". While historical gold/silver ratios may be academic, it's worth noting that if there was to be a shift in the ratio towards previous lower levels, then the silver price would have to increase significantly, or the gold price would have to fall substantially. And since BullionStar believes that the that the gold price is supported by strong fundamentals and other rationales, then a shift in the ratio towards lower levels would imply the need for a higher long-term silver price. The Gold to Silver ratio is used by many analysts as a timing indicator to help inform the decision as to whether it may be a relatively better time to buy silver compared to gold. When the ratio is at the high end of its long term range, some analysts recommend investors to shift from holding gold to holding silver in their portfolios. 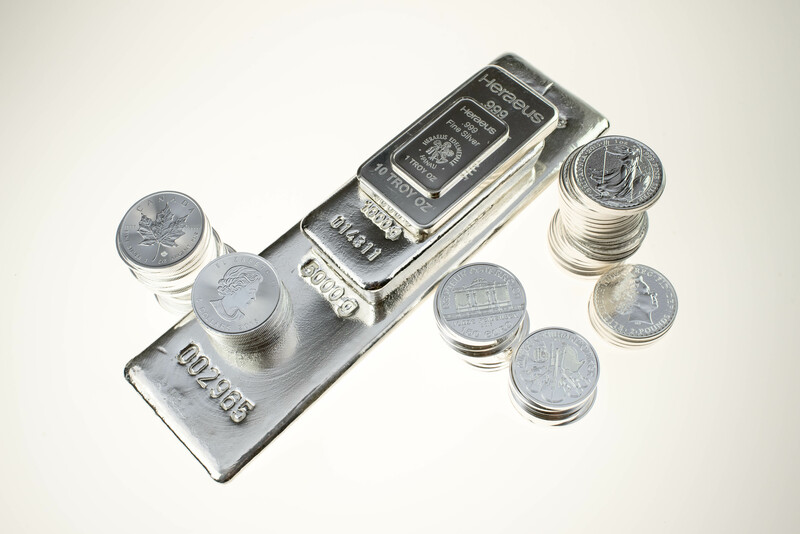 There are different ways of saving or investing in silver such as owning physical silver bars and silver coins, investing in silver mining stocks, investing in physically-backed Exchange Traded Funds (ETFs), speculating on silver futures and spread-betting, and investing in synthetic products leveraged to the silver price. One of the most important aspect to consider when buying silver is counter-party risk. If one of the reasons that you buy silver is to protect yourself against systemic financial risk, it makes sense to own physical silver bars and silver coins. Apart from silver bars and silver coins, other types of silver investments are at least one step removed from owning the underlying metal. Even investments into physically-backed silver ETFs such as the well-known iShares Silver Trust (SLV) do not grant holders access to taking delivery of the underlying silver. This is because s SLV's objective is merely to "reflect generally the performance of the price of silver". To truly own silver with no counterparty risk and default risk, you need to either take delivery of silver bars or silver coins or store these bars and coins in a secure location such as a vault in a stable jurisdiction, ring-fenced from the banking system. BullionStar offers an end-to-end solution for offshore silver storage. There are no taxes in Singapore whatsoever for transacting in and holding silver bullion. In Singapore, investment-grade silver bars and silver bullion coins are exempt from Goods and Services Tax (GST). When you buy and store silver bullion with BullionStar, you have 24/7 online access to view, analyze, sell, physically withdraw or audit your bullion. All metal is fully insured at full replacement value and you can take delivery anytime. For silver buyers who are unsure of the best time to buy silver or are concerned about movements in the silver price, an accumulation approach known as dollar cost averaging may be appropriate. This approach involves saving in silver on a regular basis and can be handy when you e.g. have a certain discretionary amount of savings each month for which you would like to buy silver. BullionStar's Bullion Savings Program (BSP) facilitates regular savings in fully allocated silver grams. BSP grams can be bought and sold back to BullionStar, and the process is fully controllable by the account holder via My Vault Storage. Holdings of silver grams in increments of 15,000 grams can be converted at any time to Heraeus 15 kg silver bars without any fees whatsoever. The resulting bars can be withdrawn and delivered to the account holder or else kept in storage in BullionStar's secure storage vault in Singapore. BullionStar's silver bullion products are sourced from the world's most prestigious national mints and refineries including the US Mint, the Royal Canadian Mint, the Austrian Mint, Germany's Heraeus refinery and Swiss refinery PAMP Suisse. These mints and refineries guarantee the purity and authenticity of their bullion products, and are some of the best known brands in the bullion industry. 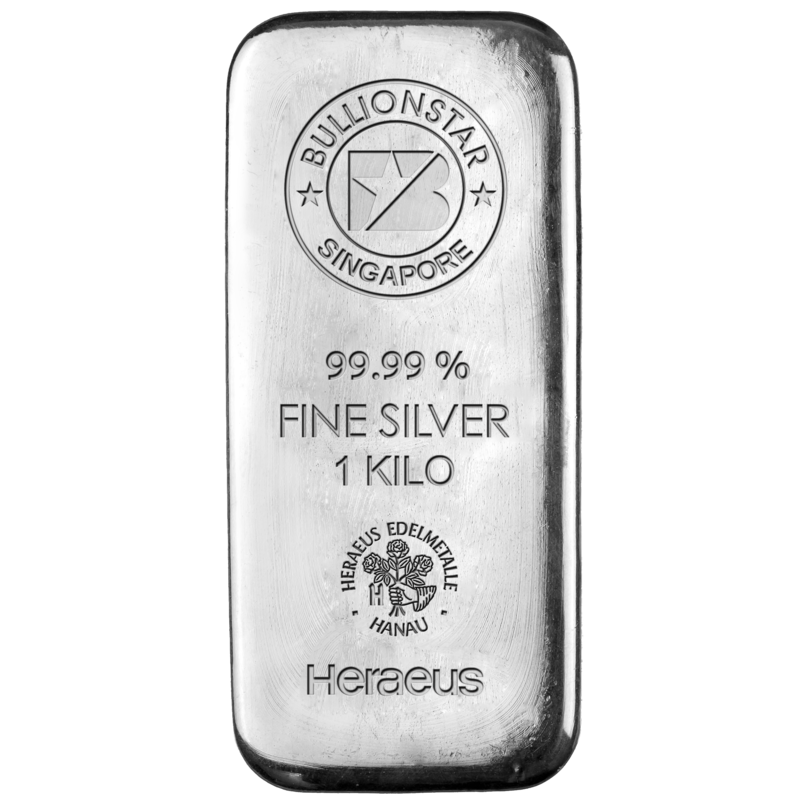 BullionStar has also commissioned it's own BullionStar 1 kg 99.99% fine silver bar, manufactured by Heraeus in Germany. 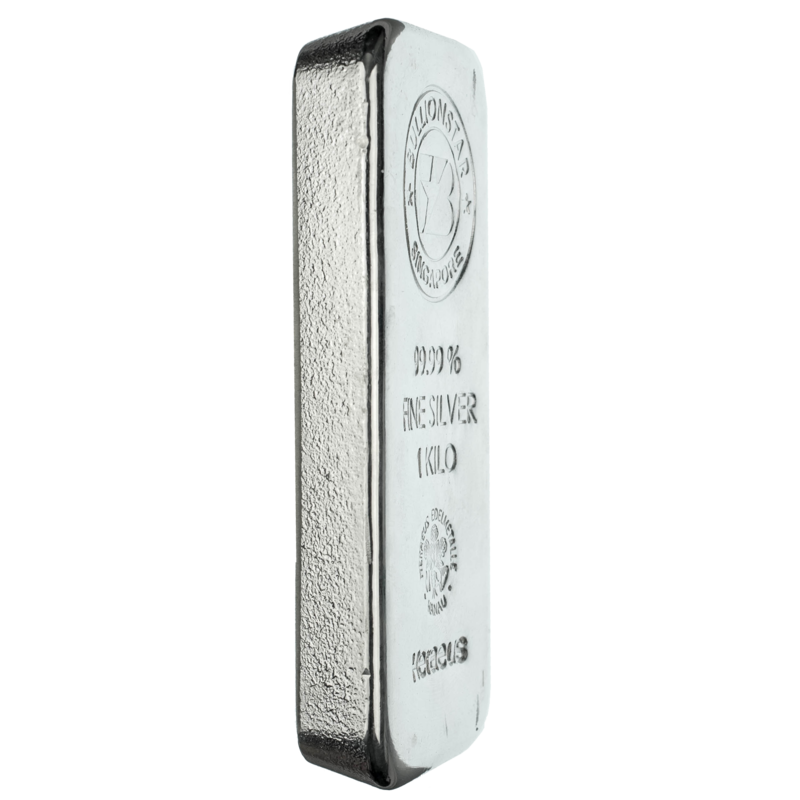 The BullionStar 1 kg silver bar can be traded with no spread between they buy and sell price. Picture: BullionStar's Silver Bar which can be traded with no spread between the buy and sell price!